If you’ve never heard of or read a book by Tamora Pierce, I feel intensely sorry for you. You should rectify that immediately. 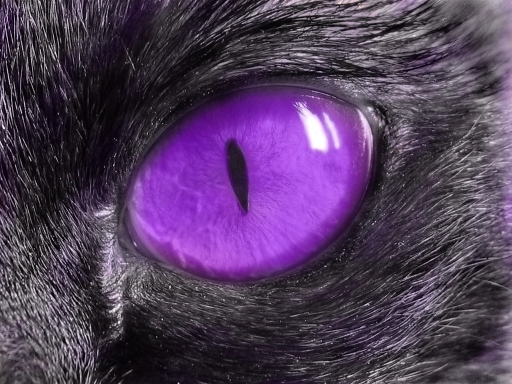 Pierce’s books mostly follow the adventures of female protagonists in a heavily medieval fantasy realm called Tortall. Her characters are brave, strong, and extremely well written, with love stories that manage to be both compelling and also ancillary to the point of the books. I like her. 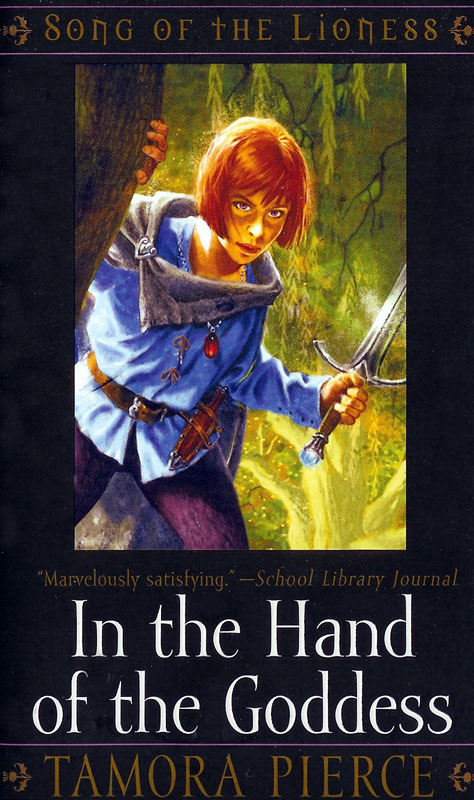 I’ve mentioned her on here before, actually, usually in reference to a series of hers that followed Alanna, the first female knight of Tortall (The Lioness Quartet) as she fought against prejudice, disguised herself as a boy, and moved heaven and earth to get her banner. Along the way, since this is YA Fiction, after all, she falls in love with George Cooper, the Rogue (like the king of thieves kind of deal), and convinces him to give up his life of crime and come raise her children. All super cool. 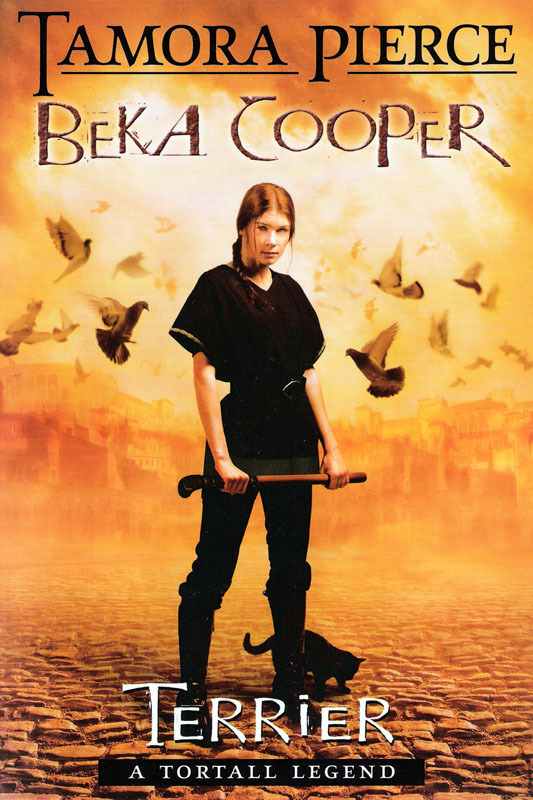 The series I most recently read was about Beka Cooper, George’s great-something grandmother, a Dog (cop) in the same city where George later becomes king of thieves. Which kinda raised my eyebrows. You see, the Alanna books were written first, and they follow a protagonist who is breaking all of the rules of society by choosing to fight instead of study magic and embroidery. Alanna is a rebel. But Beka Cooper? Isn’t. 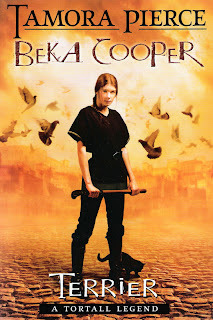 So the Beka Cooper books follow Beka as she enters her “Puppy” training in the lower city of Corus, the capital. It’s basically a medieval fantasy version of Training Day, where Beka is up against thugs and jerks and smugglers and drug peddlers, and all kinds of human nastiness. She’s a cool character because she’s very quiet-spoken, but extremely determined. She proves herself quickly as a talented Dog and slowly but surely rises up in the ranks. The third book, Mastiff, has Beka on a mission from the king himself, searching for the crown prince. What’s very interesting, though, is that Beka is not one of a kind. In her time as a Dog, we meet other female Dogs, especially her partner Goodwin, who is Beka’s elder by about ten years, and at the end of the series is rising in rank to be the commissioner of all the city Dogs. We also run into the Lady Sabine, who is a female knight, and by the end of the series we meet Nomalla too, another lady knight. These women aren’t novelties, they’re just accepted as another part of life here. Part of me assumed that the shift from full female integration in the culture to the exclusion of women from “harder” jobs was the result of a mistake on Ms. Pierce’s part, but I can see now that this isn’t true. Some two-hundred years pass between Beka Cooper and Alanna’s time, and in that time, Pierce seems to suggest, a very big change comes to Tortall. This change is that of the “Cult of the Gentle Mother”. We start hearing rumblings as early as the second Beka Cooper book that a new cult is rising in Tortall, one that insists that women are pure at heart and can only be sullied by doing strenuous or dangerous work. They claim that a woman’s true place, if she is to be wholly happy, is with a babe on each breast and another in the womb. The cult plays a fair role in the last book of the series too, where we see this insidious cult dragging down the noble families, one by one. Daughters are refused the rights to become knights. Fewer and fewer women turn to Dog work. Slowly the world starts to hem the women in. Now, Beka, fortunately remains aloof from that, which is very comforting. She does marry at the end of the three books (SPOILER), but the man she marries is perfectly comfortable with her strength. 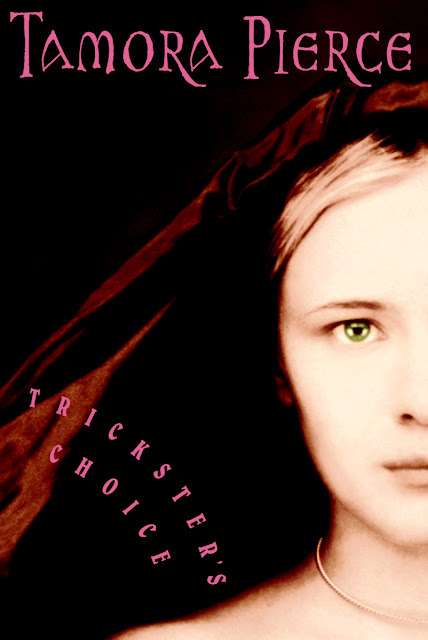 He chooses to take her last name, she is the one to propose, and he never resents her mighty deeds. He is her equal. Her fellow countrywomen, unfortunately, are not so lucky. Look, Pierce hasn’t gone into the way that the Cult of the Gentle Mother overtook Tortall, and I’m not sure I need her to. It’s more that I find it really interesting that she chose to write about a world that had equality and lost it and had to fight to find it again. Why is this important? Because it’s a very strong reminder of something I think we usually prefer to forget. Equality and freedom are not won once and then safe forever. They have to be constantly bought and paid for and kept. We are never in so solid a condition that we can afford to ignore injustice, because it will always, always come back around, and when it does, we need to be ready. This is my favorite series of hers, though. They're about Alanna's daughter. So good. One of the many things I love about the Beka books is exactly this: the appearance of the Cult of the Gentle Mother fills in the gap between the last time lady knights were seen in Tortall and Alanna. It gives a very good, believable reason for why the lady knights declined, and presumably the female Dogs as well--I don't think mentions of the Provost's Guard in Song of the Lioness include women. It seems that by Alanna's day, fighting women in Tortall are restricted to guarding the Goddess' temple grounds. The echos and ripples in the Tortallverse are so interestingly done. The Queen's Riders are part of Alanna's legacy, but Alanna is part of Sabine's, and the Riders are more akin to Beka's work. It all fits together. I suppose it remains to be seen if women will become part of the Dogs again; I hope so. I hope they will. I'd love more stories about the Dogs. Beka is one of my all time favorite characters (though I hold a major soft spot for Aly too). I really appreciated that Pierce didn't just create a world where women are second class, or a world with perfect equality. The push and pull of cultural forces is what makes the series interesting and what gives the stories weight.